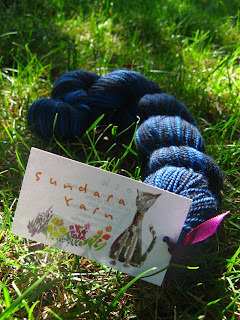 A couple of months ago, I was puttering around Ravelry when I saw a rare "for sale" tag on a skein of Sundara Sock, and immediately messaged its owner (thanks, nlarson!) with a request to buy it. The first time I saw it was way back in 2007, on Brookylntweed's blog. This was shortly after my obsession with socks began, and I filed away the name of the yarn under "must find eventually, when I has monie!" section of my yarny brain. So it's quite a treat to have a real live skein in my stash. Actually, shortly after taking this picture, I wound it into a center-pull ball, but you get the idea. Just to be original, I think this is going to end up as a triangular scarf as well. I have an idea that I might cast on this afternoon, perhaps on my off time at work. 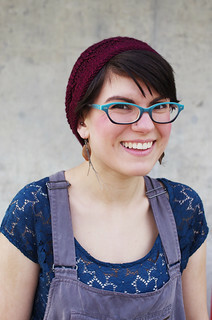 I've had so little time to knit lately that my knitting fantasy life is starting to overtake my actual knitting life. Also: today Amai is off to her rightful owner! Marcee of Criation Station Alpaca Farm commissioned me to make a summery top out of alpaca, and so, although I'll probably be making another for myself pretty soon, the original is going to hang out at the farmer's market to help sell yarn until late fall. The other day, one of my housemates was out doing laundry when she found out that our row of houses was having systematic fire drills. At that point, it was about 10:30 pm, and although I kept on hearing fire alarms going off down the street, I didn't think much of it. When she got back upstairs, she told all of us that there was probably going to be a fire drill, so we probably shouldn't get too comfortable. Thus, comfortable I did not get. I took some cashmere from my stash and started casting on for Miralda's Triangular Shawl, for which the cast-on is about 330 stitches. About an hour passed, and nothing happened. One of my housemates went to bed. Another went off for a long walk. I sat on my bed and cast on and counted and re-counted 330-odd stitches. I'm using some pink Jade Sapphire cashmere that my mom sent me last year, and it's pretty delicate, so I was trying to be careful. At one point, I came upon a knot in one of the strands I was using to cast on (it has a doubled cast-on edge) and started mumbling obscenities under my breath. Then I carefully picked the knot apart. Right as I was beginning to spit-splice the two ends together... the fire alarm went off. Cashmere was thrown to the side, shoes were applied to feet, and stairs were tromped down, all while yelling "Freaking seriously!?" to my housemates, all of whom were in various states of dress because it was 11:45 on a Wednesday night.